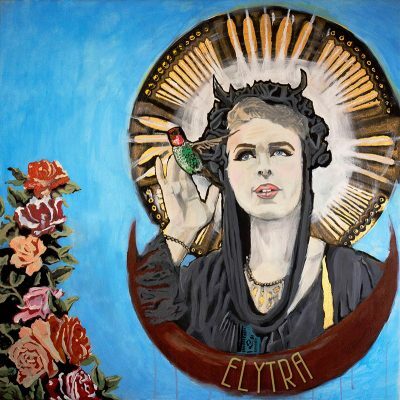 It’s no shocker that Elytra would quickly become successful in the local music scene, especially after opening for Grimes at the Twilight Concert Series. Elytra’s bandmates are powerhouses—each masters of their instruments—and it’s obvious while listening to Embers and Stardust. Scotty Ray has the vocal and lyrical prowess of the group. Secily Saunders creates soothing sounds on guitar while Janet Chotia provides a more somber mood on bass. Lindsay Heath brilliantly plays percussion, including piano and the plethora of various drums present in the album. Chris Murphy adds both funk and new-age vibes on synth, acoustic guitar and keys. Adding a unique touch to the album while enriching the new-age, gothic element is Tanner Crawford on cello. With each song, I thought to myself, ‘This one is my favorite.’ Elytra boldly brings up tough subjects such as addiction, mental illness and gender dysphoria—but does so without depressing or upsetting their listeners. In fact, Elytra is a much-needed burst of optimism and love. They combine ballad songs with new age lyrics and mix it in with groovy pop music. Each song is chilling, inspiring, heartbreaking and hopeful.